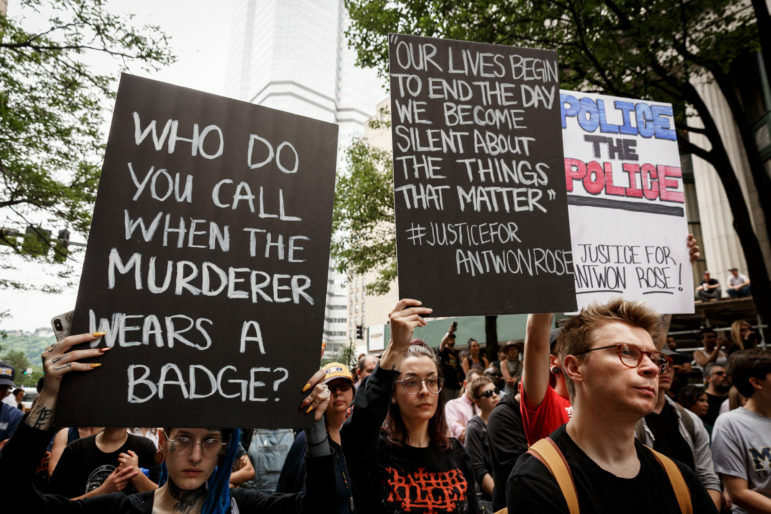 Update (June 27, 2018): The Allegheny County District Attorney's Office charged East Pittsburgh Police officer Michael Rosfeld with criminal homicide in Antwon Rose Jr.'s death. His bail was set for $250,000 by a magisterial district judge. The DA's office said in a statement that they believe setting bail was "improper" because statute indicates that anyone charged with a crime that could result in life in prison is not entitled to bail. However, DA spokesman Mike Manko said the office does "not plan on contesting it at this time." PublicSource reporter Jeffrey Benzing live-tweeted the DA's press conference on Wednesday morning. The Allegheny County Police Department has also charged 17-year-old Zaijuan Shawntez Hester in connection with the North Braddock shooting. Hester is believed to be the third person in the vehicle other than Rose and the driver. Police charged Hester with aggravated assault, possession of firearm by a minor, receiving stolen property, persons not to possess firearms and criminal attempt. 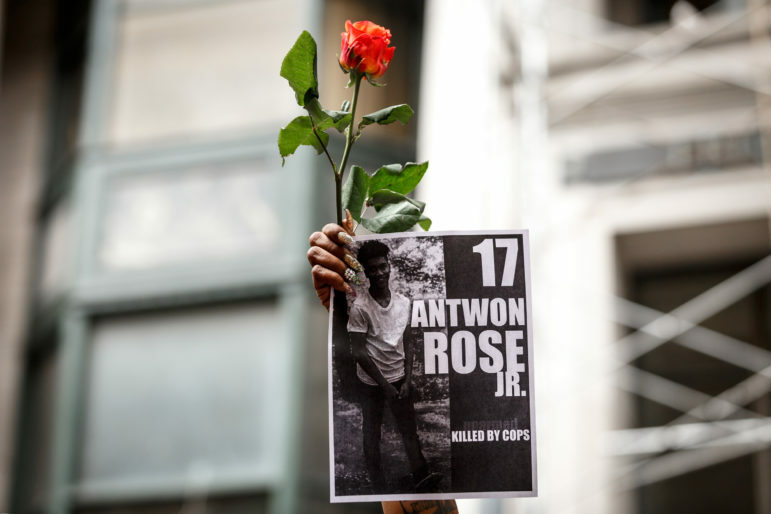 Chanting and waving signs, hundreds of people rallied outside the Allegheny County Courthouse in Downtown Pittsburgh on Thursday to protest the killing of unarmed black teenager Antwon Rose Jr. by a police officer. 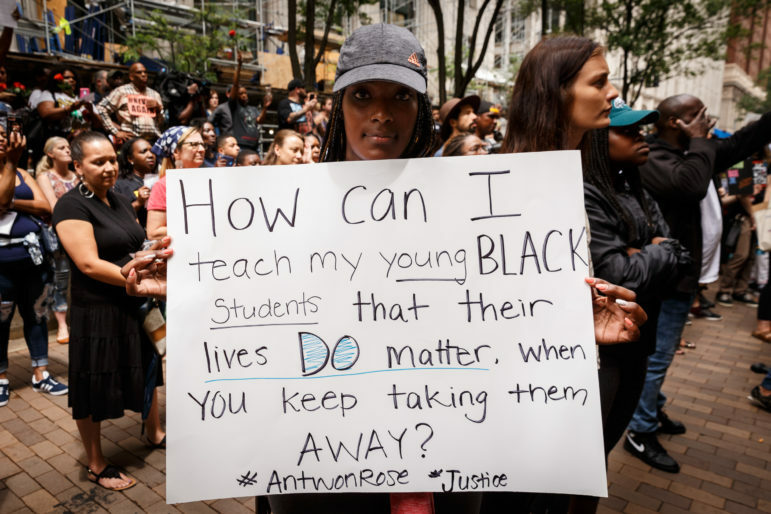 Rose, a 17-year-old senior at Woodland Hills High School, was fatally shot by an officer of the East Pittsburgh Police Department the evening of Tuesday, June 19. 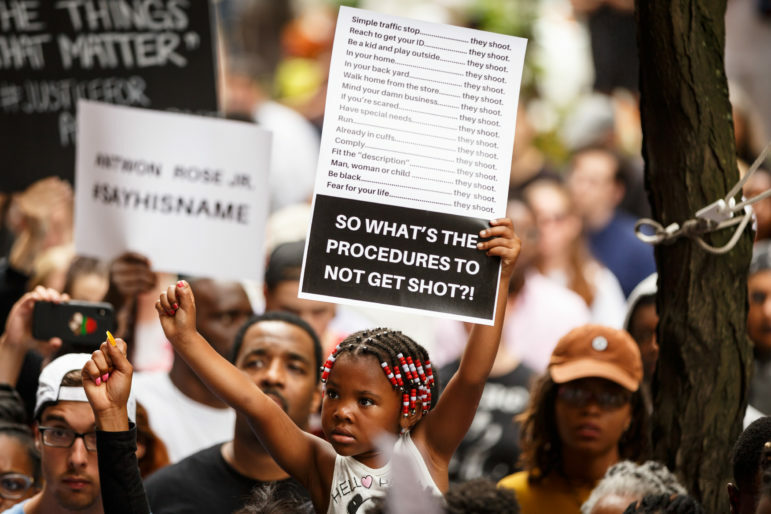 On Thursday afternoon, the Allegheny County Police Department identified Michael Rosfeld as the officer who killed Rose. Allegheny County Police Superintendent Coleman McDonough said in a press conference on Wednesday that around 8:30 p.m. Tuesday, police received reports of a shooting in North Braddock. He said the victim was shot from a passing vehicle, which witnesses described as a silver Chevy Cruze. At 8:40 p.m., police stopped a silver Chevy Cruze in the adjacent borough of East Pittsburgh, ordering the driver — who was later questioned and released — to leave the car and get on the ground. Two guns were found in the car. Two passengers — Rose and another person who has not been found — exited the car and started running away, McDonough said. What happened next was caught on a graphic video posted to social media: East Pittsburgh officer Michael Rosfeld fired his gun, striking Rose three times. Rose was then transported to McKeesport Hospital, McDonough said, where he was pronounced dead at 9:19 p.m. on Tuesday. In a statement on Thursday, Allegheny County Executive Rich Fitzgerald called for a “thorough, swift and transparent review and investigation” of Rose’s death. 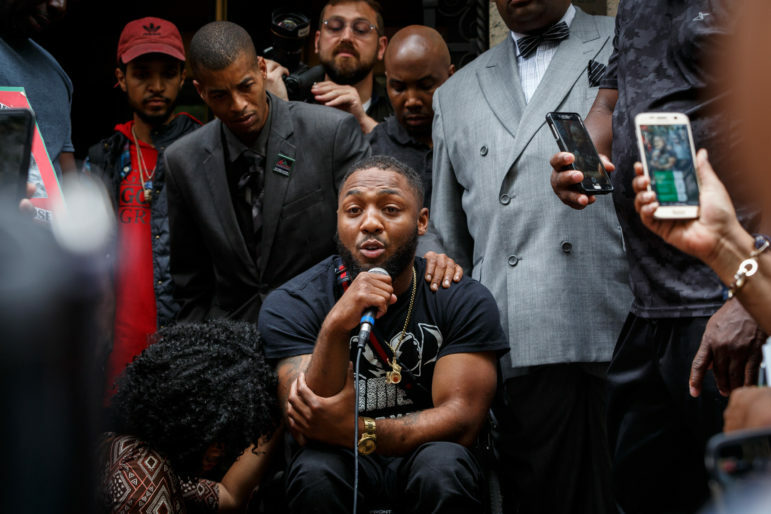 “It is our hope that the district attorney and the Allegheny County Police Department conduct a thorough and expeditious investigation of what occurred between Antwon and the police officer in a way that is transparent and honest, in order to keep a level of trust between the community and police,” they wrote. 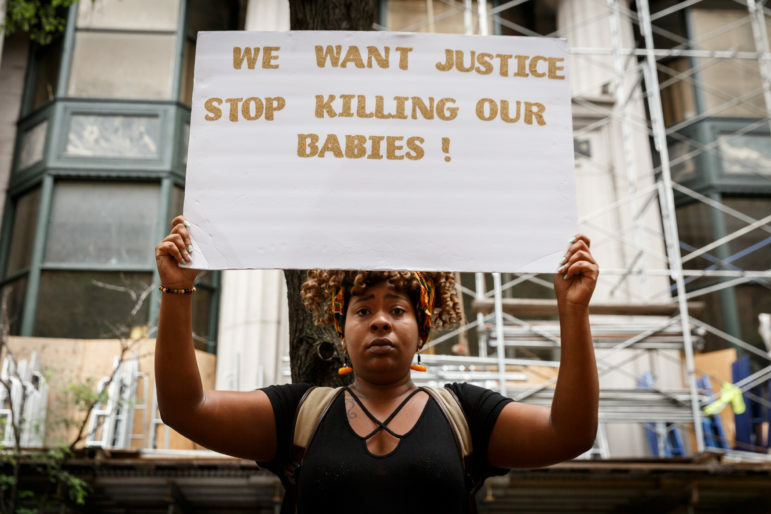 Protesters on Thursday called for Allegheny County District Attorney, Stephen Zappala, to resign, saying they don’t trust him to bring justice to Rose’s death. 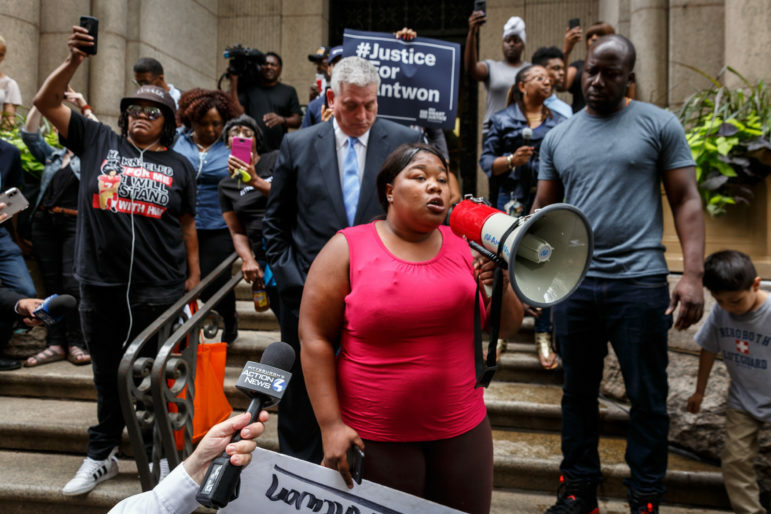 Brandi Fisher, president and CEO of the Alliance for Police Accountability; Joel Sansone, a local attorney who has represented victims of police brutality in court; and Summer Lee, a Democratic candidate for Pennsylvania’s 34th House District, were among those who spoke at the rally. Speakers asked for empathy and justice for Rose and other victims of police violence and reminded attendees to vote and run for office. Photos by Maranie Rae Staab for PublicSource. 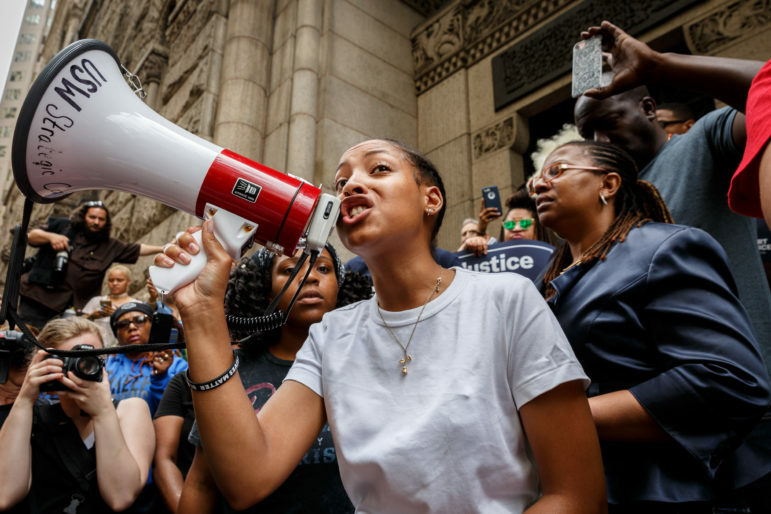 Anyah Jackson, 18, of Pittsburgh, a member of the Youth Power Collective, rallies the crowd using a bullhorn. 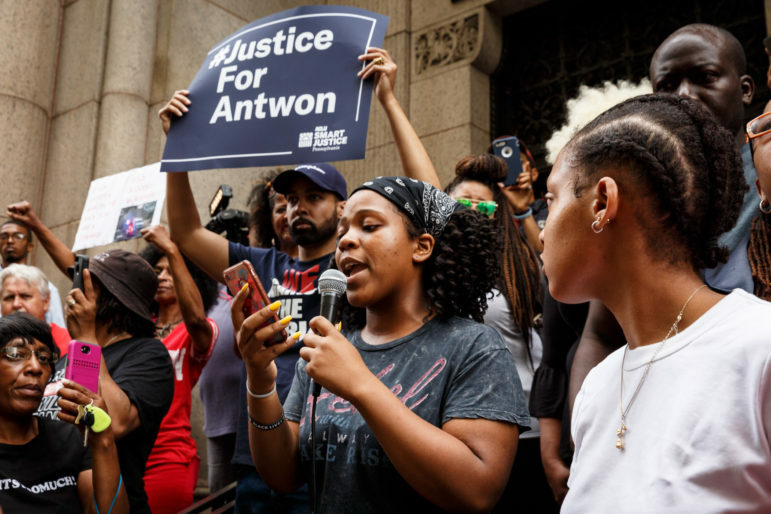 Several hundred people gathered on Grant Street in front of the Allegheny County Courthouse on Thursday to protest the death of Antwon Rose Jr. The Allegheny County police are investigating the teenager’s death and named the police officer who killed him as Michael Rosfeld of the East Pittsburgh police. 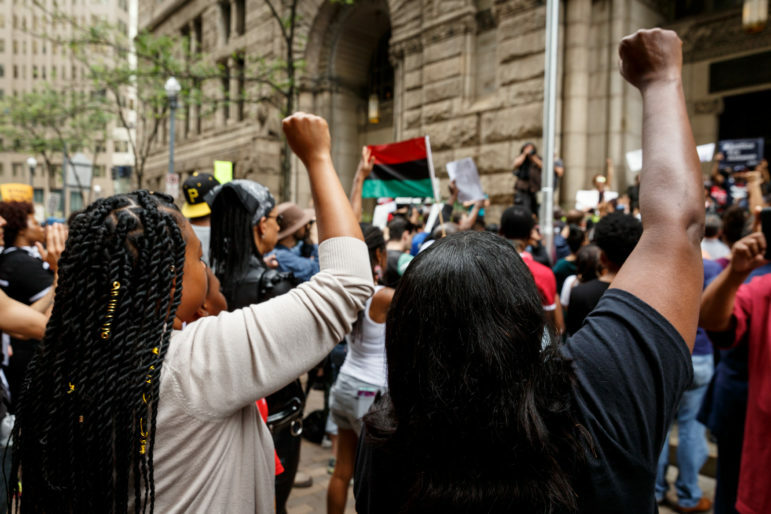 Protestors raise their fists as they rally in front of the Allegheny County Courthouse. Chants calling for Allegheny County District Attorney Stephen Zappala to resign rose up periodically throughout the rally. 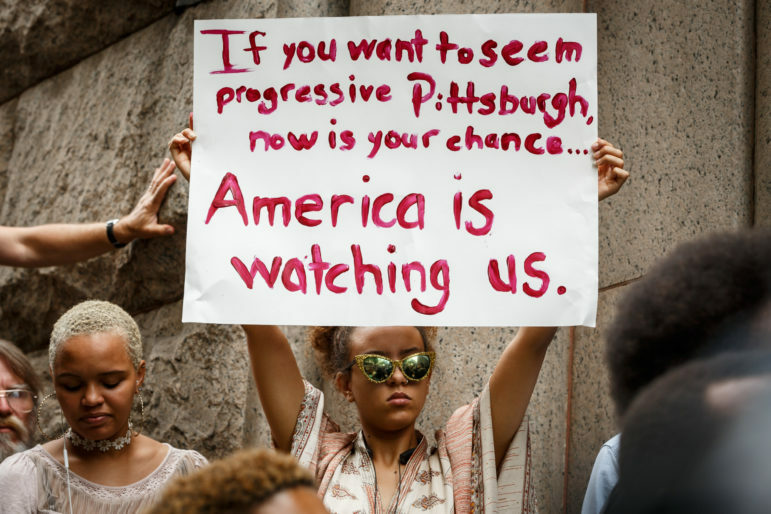 “If you want to seem progressive, Pittsburgh, now is your chance. 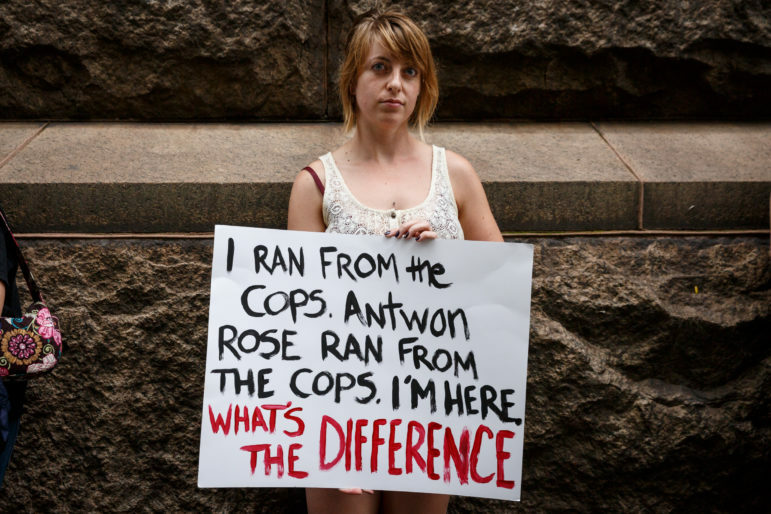 America is watching,” read a protester’s sign. In the hours after the shooting, Pittsburgh Mayor Bill Peduto tweeted several times trying to distinguish between East Pittsburgh, the borough where the shooting happened, and the city he governs. He later apologized for those tweets. 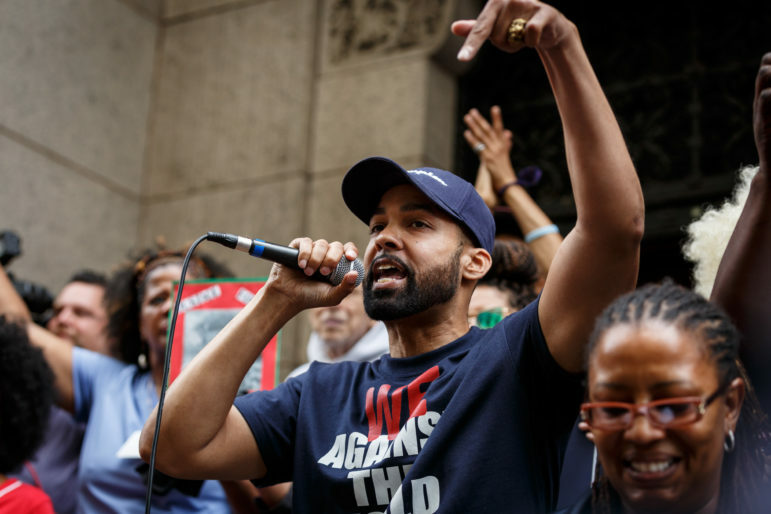 Jasiri X, a hip hop artist and co-founder of 1Hood Media, speaks to the crowd gathered on Grant Street in Downtown Pittsburgh. 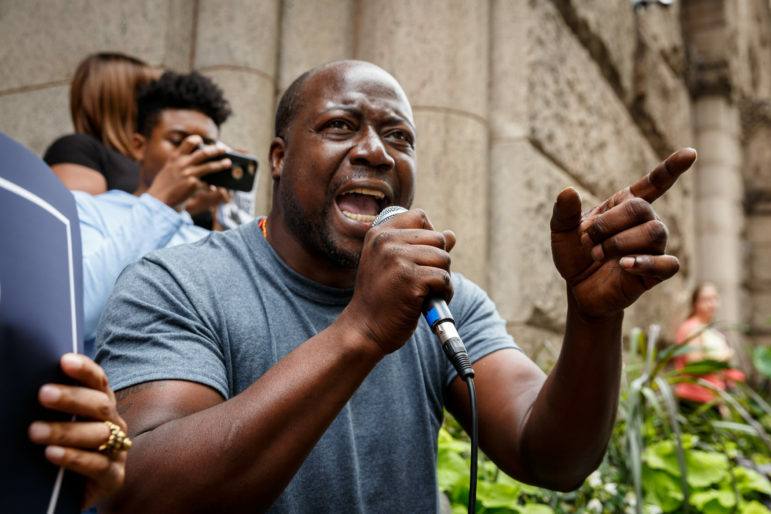 He asked that the protestors think about Antwon Rose’s family as they grieve his death. “As hurt as we are, I can’t imagine how it feels to be his mother, his father, his aunt, his uncle and his cousin,” he said. Two protestors hold signs and raise their fists at Thursday’s rally. 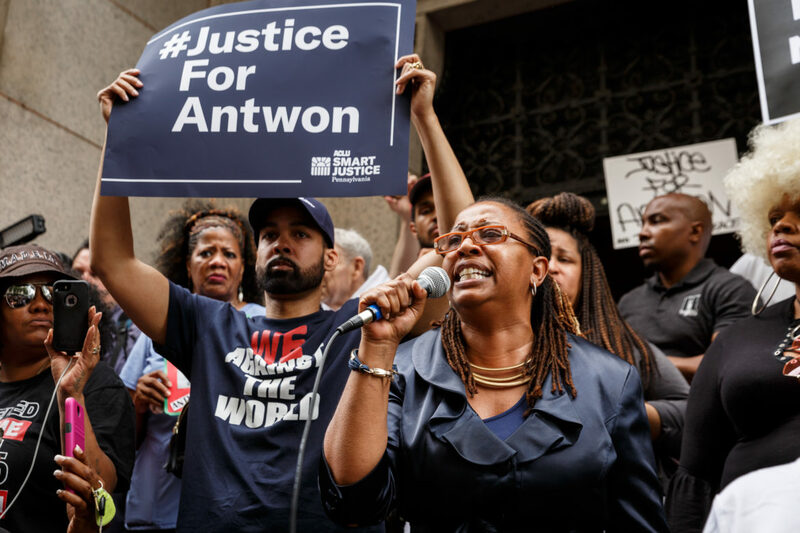 Chants of “justice for Antwon” rang out among the crowd. 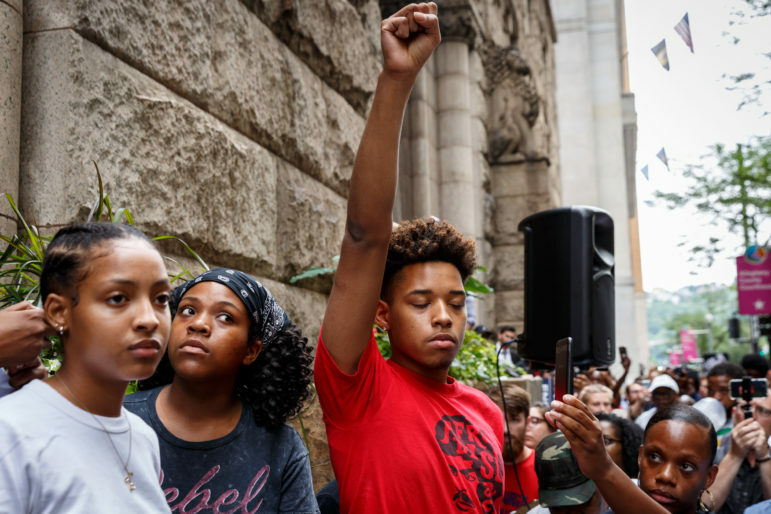 A person hangs their head at the rally, protesting the death of Antwon Rose Jr. Several people, from speakers to attendees, cried openly for the loss of the teenager. 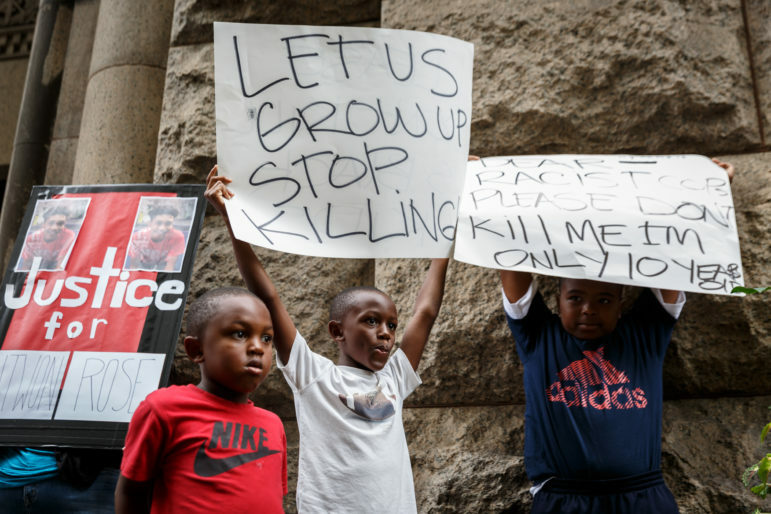 Protestors hold signs calling for justice in the killing of Antwon Rose Jr. “We need justice for Antwon Rose. 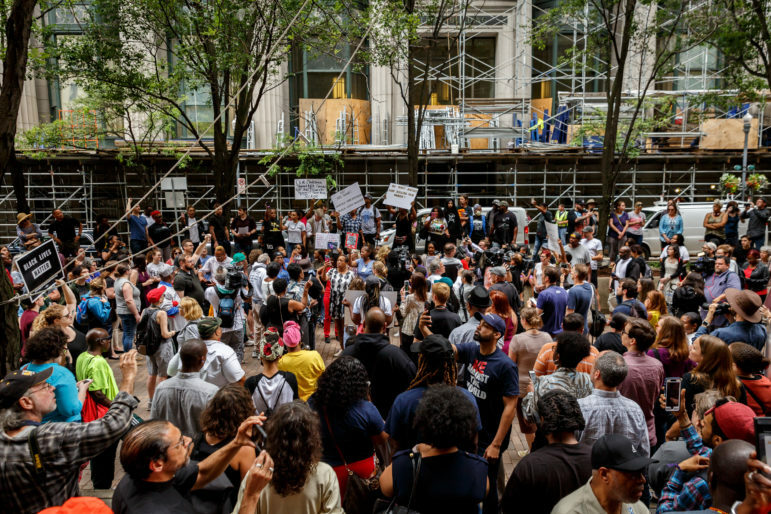 You people are part of that,” Joel Sansone, a Pittsburgh attorney who has fought police brutality cases in court for 35 years, said to the crowd. Maranie Rae Staab is a photographer and journalist based in Pittsburgh, Pa. She can be reached at maranie.staab@gmail.com. J. Dale Shoemaker is PublicSource's government and data reporter. He can be reached at dale@publicsource.org or 412-515-0069. You can follow him on Twitter @JDale_Shoemaker. He can be reached securely at PGP: bit.ly/2ig07qL. Madeleine Davison is an editorial intern for PublicSource. She can be reached at madeleine@publicsource.org. You can follow her on Twitter @madeleinegdav. What does hate look like? 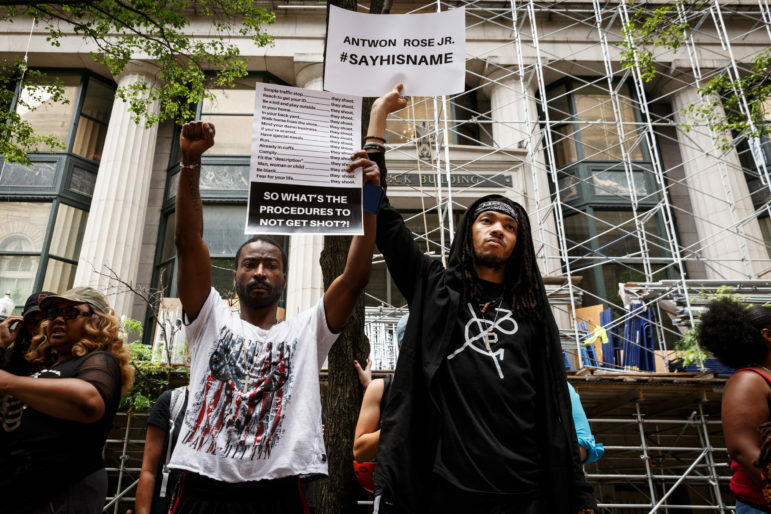 A guide to symbols used by hate groups in PA.
PublicSource has compiled a list of symbols that represent hate groups in the state. 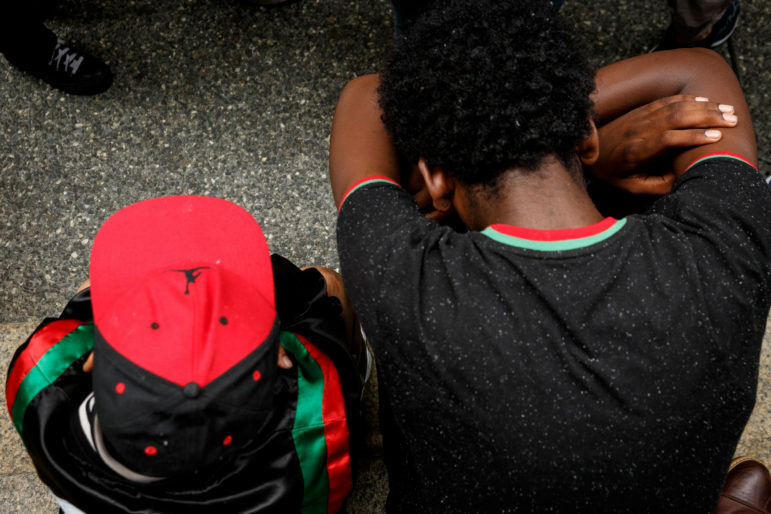 Out of 49 hate crime charges in Allegheny County, only one led to a conviction. Why?